The Arts Festival is Here! One of our biggest weeks is here: the week of the Columbus Arts Festival. Thousands of hours of work by hundreds of people results in a memorable weekend of art, music, craft, food and family activities on the downtown riverfront. Both the presenting artists and Festival guests travel from miles around to experience this event, which lines the downtown bridges and riverfront. The whole Festival weekend makes us so proud to represent all the arts in Columbus’ cultural scene. The Festival is always a blend of the old and the new. We all have our regular stops — returning artists we always visit, a favorite food vendor, a band we love to see live — but the fun of the Festival is also what’s unique to each year. In 2018, for instance, we’re making the Festival even easier to navigate with a foldable pocket map and a free app that lets you search for artists, browse stage schedules, locate food vendors and menus, find amenities and more. We’re also debuting a new stage, the Genoa Park Stage, along the west side of the river; 20 bands will perform there throughout the weekend. Close by is a new Local Craft Beer Garden presented by Blue Moon, so Festival guests can enjoy Columbus beers. And we’re excited to welcome a pair of national headliners to the ABC6 Bicentennial Park Stage: Postmodern Jukebox on Friday night and G. Love & Special Sauce Saturday evening. CoverMyMeds and Worthington Industries have helped bring these free concerts to the Festival. The always-popular Hands-On Activities Village will move to the west side of COSI, next to the new Scioto Peninsula Park, which means families visiting the Festival can discover local arts groups, the Children’s Gallery, playgrounds, shaded picnic areas, children’s theater performances and family care stations all in one place. We couldn’t make the Festival happen without the dedicated leadership team, our supportive partner organizations, our small army of volunteers and our generous sponsors. American Electric Power has been a wonderful partner in presenting the Festival. ABC6, FOX28, Dispatch Media Group and WOSU Public Media have done an excellent job spreading the word. LBrands Foundation, Smart Columbus, Toyota, Huntington, The Ohio State University, White Castle — their support is crucial to the success of the Festival. This weekend you’ll see hundreds of volunteers in blue T-shirts assisting artists, running beverage and merchandise booths, working as stagehands and everything else. Be sure to thank them for their hard work, and Bank of America for sponsoring the volunteer team. Speaking of T-shirts, Homage has designed a limited edition vintage shirt using the Festival’s 1992 logo (I’m modeling it in my photo on this blog). I suggest picking one up this weekend at a Festival Merch booth. We’re also selling kid’s shirts designed by CCAD students, and the standard Festival shirts printed by Tonic Studios. Friday night we’re celebrating at the Patron Party at the Cultural Arts Center. It’s a chance for us to gather, enjoy wonderful food and drink, live music and a live painting demonstration. This year was the first we made the Patron Party a ticketed event; we’re proud to say it sold out quickly, and even prouder that the proceeds from the ticket sales go directly to increasing the award amounts for our exhibiting artists. 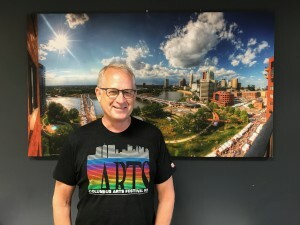 This is one more step in making the Columbus Arts Festival the world-class event that it is. I hope to see you at the Festival this weekend! Just look for me – I’ll be wearing a green staff T-shirt! How Does Art Inspire Your Heart?